In this post, I will show you how you can register for trial version of SOA Cloud Services. You need to follow below steps in sequence for trail registration. 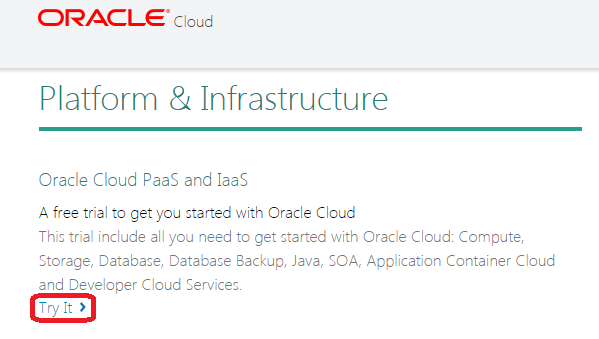 Step 1: Go to URL: https://cloud.oracle.com/tryit and you notice there are mainly two categories as mentioned below. Under each category there are multiple options available. Since we are working with Oracle SOA Cloud Services and that comes under Paas and IaaS category. So go to that category and select very first option as highlighted in below screen shot. 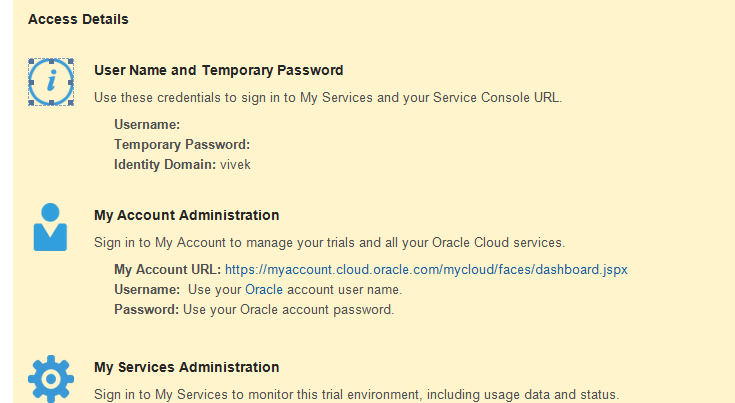 Step 2: Once you click on “Try It” option, it take you to Oracle login page where you need to enter your credentials. Note: You need to have Oracle account setup before you proceed to this step, if don’t have Oracle account then you can create it. Once you enter your credentials, it takes you to next page where you need to enter your details like First Name, Last Name and Company Name etc. You also need to verify your phone number by entering the verification code. You need to mention “Identity domain” value, you can choose any value as that will get appended to your service URL as shown below in the screen shot. Accept the Terms and Conditions and click on Sign Up. After Sign up, you see below success message. Now you should receive email from Oracle within 7 days with your username and password to access SOA Cloud Services and with setup instructions. Step 3: You receive email from Oracle with all required details and credential for login. this is a trial version just for 30 days, is there a way to keep on extending it?? It is for 30 days only, however you can register for 2 trials under one email id so in total you get 60 days of trial for one account.